Are you looking for Plumbers in Edgworth? Thermal heating services here to help. We deal with most types of domestic and commercial plumbing. Here is a list of some of the services we offer, if you don’t see what you’re looking for please don’t hesitate to give us a call. Experiencing problems with your boiler? We have got a list with some of the common problems with boilers, if you’re experiencing any of these problems it’s time to call a boiler repair expert! 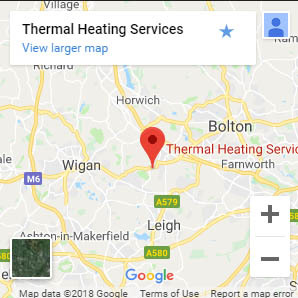 If you’re looking to replace your home or business central heating system, we are sure we can accommodate your needs in Edgworth. All our technicians are COGI registered, fully qualified boiler and central heating installation experts. Thermal Heating Services are experts in underfloor heating in Edgworth. Underfloor heating is installed by created a sub-floor and laying pipes within the sub floor to create a network of pipes carrying warm water, underfloor heating is becoming a popular choice for a modern home. This method is an energy saving installation, the systems works from lower temperatures and works more efficiently.